But a very intriguing read all the same. I’m not 100% sold on this book being helpful for tweens or even teens… especially if they are actively being bullied but it could be a valuable resource for parents. It is interesting to see just how differently people respond to the same sorts of stimulus – what causes some young people to become bullies is the same sort of experience that turns others into a victim of bullies. It just goes to show that everyone is different and everyone reacts differently to stress and strain. And for the young person who has a good relationship with Christ, this insight will definitely help them to forgive and love the bully… perhaps even giving them an opportunity to share God’s love with their bully! Bullies aren’t born mean—through the vicious cycle of mean, bullies are made. According to the Ambassadors 4 Kids Club, one out of every four students is bullied—and 85% of these situations never receive intervention. Parents, students, and teachers have amped up solving the bullying problem for a networked generation of kids. 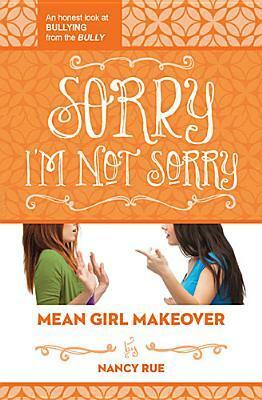 Written by bestselling author Nancy Rue, each book in the Mean Girl Makeover trilogy focuses on a different character’s point of view: the bully, the victim, and the bystander. The books show solid biblical solutions to the bullying problem set in a story for tween girls. Sorry I’m Not Sorry tells the story of Kylie Steppe, former queen bee of Gold Country Middle School. After bullying a fellow GCMS student, Kylie has been expelled—and she has to attend mandatory counseling. Without her posse to aid her and other peers to torment, Kylie focuses on the person who stole her GVMS popularity crown: Tori Taylor. As Kylie plots revenge on Tori, she attends therapy sessions, where she reveals a few details that might explain why she finds power in preying on her middle school peers. After a rough year with bullying backfire, will Kylie decide to become more empathetic with her peers? It’s hard for tweens to imagine why a bully acts the way she does. Sorry I’m Not Sorry shows girls that they hold the power to stop bullying through mutual understanding and acts of love.